Since his debut vintage in 1978, Josh Jensen has shown he has the magic touch with Pinot Noir. This once-in-a-lifetime tasting traced the arc of Jensen’s brilliant career through a series of remarkable Pinots that set the bar for what is possible in California. A native of the Bay Area, Jensen attended high school on the East Coast and then pursued graduate studies in England. While Jensen’s friends flocked to careers in finance, law and banking after school, Jensen had caught the wine bug thanks to George Selleck, a collector and close friend of his father's. In 1970, Jensen worked the harvest at Domaine de la Romanée-Conti. An internship at Domaine Dujac followed in 1971. Later that fall Jensen returned to California with a mission: to find a site rich in the limestone he had been trained in Burgundy to covet. There was only one problem – neither Napa Valley or Sonoma has vineyards planted on limestone. After consulting with geologists Jensen found the limestone he was searching for in San Benito County and specifically on Mt. Harlan, which is located in the Gavilan Mountain range, south of San Francisco. Even today, Mt. Harlan is extremely rugged and remote. Water has to be trucked up to the vineyards and there is pretty much nothing but the barest essentials at the top of the mountain. It’s hard to imagine what things must have been like 40 years ago. Jensen planted 500 vines in 1974 with cuttings he had brought back from Burgundy, something that would be much harder to do today than it was in the early 1970s. Development in earnest began in 1975 with three parcels, one of which Jensen named after his early mentor, George Selleck. Drought immediately reared its head in 1975 and then 1976, the first back-to-back drought vintages going back to the previous century. Those early experiences served Jensen well, as hot, arid conditions have become increasingly common here over the last few decades. 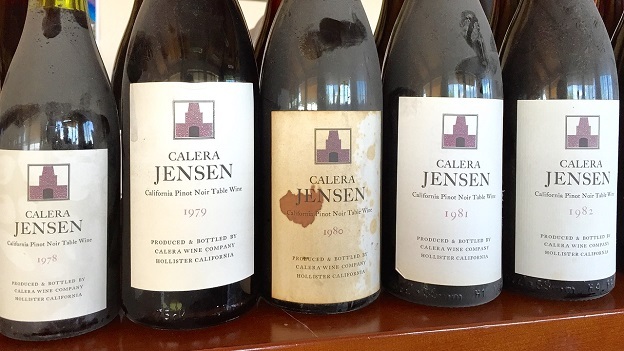 Jensen made his first three Pinots in 1978 and christened his winery ‘Calera,’ the Spanish word for the limestone kiln on the property that remains intact. Today, the Calera holdings comprise numerous plots, all within Jensen’s sprawling Mt. Harlan property. Target yields are around two tons per acre, although those yields are rarely achieved, especially in modern times, when drought has been such an issue. According to Jensen, drought impacts yields quite materially, but has less of an effect on overall quality. From the beginning, Jensen has been a big believer in the virtues of whole cluster fermentation, a practice he first learned in Burgundy. With the exception of the de Villiers, all of the Calera Pinots are done with 100% whole clusters. One of the features of whole cluster fermentation with this fruit is that it drives acids low and pHs high. As a result, the wines are almost always acidified. New oak is around 30%. No Calera Pinot Noir has ever been filtered. For the most part, all of the wines in this tasting performed brilliantly. There were one or two disappointments, which is normal with so many vintages, but many more pleasant surprises. Because the wines are never filtered, many of the older vintages throw quite a bit of sediment and require decanting, something readers still cellaring these wines should keep in mind. I also found the acid additions a bit more obvious in some of the older wines from the early to mid 1980s, but again, that is not surprising with wines of a certain age. My preference is to drink the Jensen Pinot around age 10-15, but many vintages will continue to develop beyond that. All of the wines in this tasting came from Calera’s passive cellar. My sense is that the wines stored in colder cellars will show even better. The tasting ended with Calera’s three 1978 Pinots. 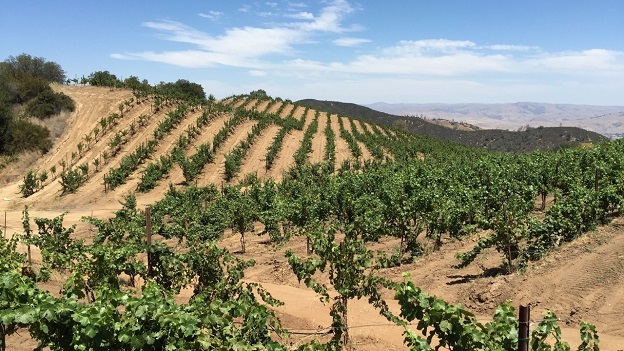 Yields were just one ton in total for 24 acres of vineyards, which is a measly 2% of normal production. To put that into context, even the most freakish years I have seen in Pinot Noir, like 2012 in the Côte de Beaune, don’t come anywhere near that level. The unusually low yields resulted in dense, massively tannic wines that needed decades, not years, to come together. Jensen took the unusual step of bottling all of his 1978s only in half bottles. 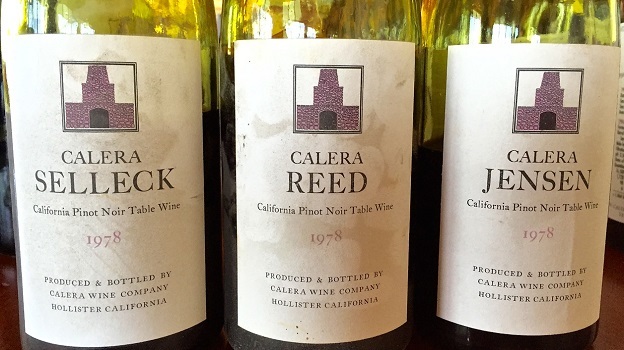 Even today, those wines are majestic, and a testament to the vision that has put Josh Jensen and Calera among California's elite Pinot Noir producers.